Both NAND and DRAM prices began dropping in the second half of 2018 after a couple years at record highs. Product oversupply and excess inventories are signaling a bleak outlook for the memory market in the first half of 2019. With these conditions in mind, SK Hynix and Samsung have slowed or put on hold their plans for capacity expansion in 2H18 and 2019. 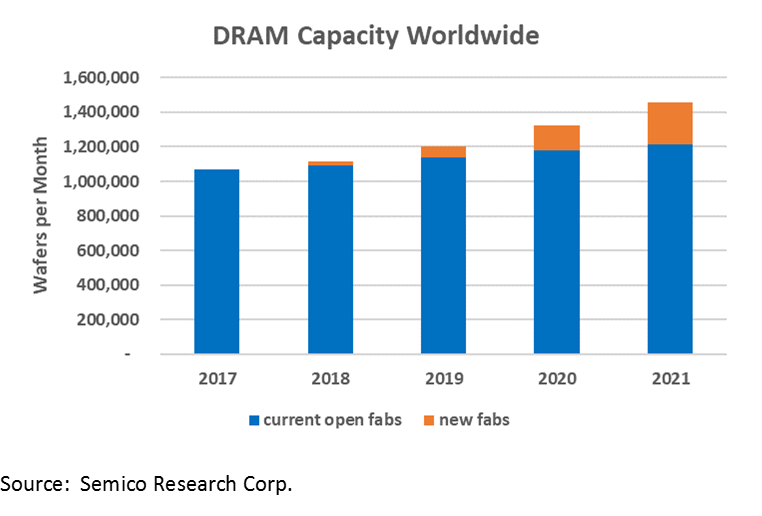 The chart below shows DRAM capacity worldwide from 2017 to 2021. The blue portion of the columns represents capacity at fully operating fabs in 2018. The orange portion represents the amount of capacity being added by new fabs coming online from 2018 to 2021. These new DRAM fabs are from Innotron, SK Hynix, Samsung, Winbond, and YMTC. Micron will be updating its Manassas fab, but this is a long-term project on an existing fab, so the additional capacity is not reflected in the “new fabs” graph below. The total amount of wafer capacity added at the fully operating fabs grows about 3% per year. With the new fabs added, the total amount of capacity rises from 4% in 2018 to 10% per year by 2021. 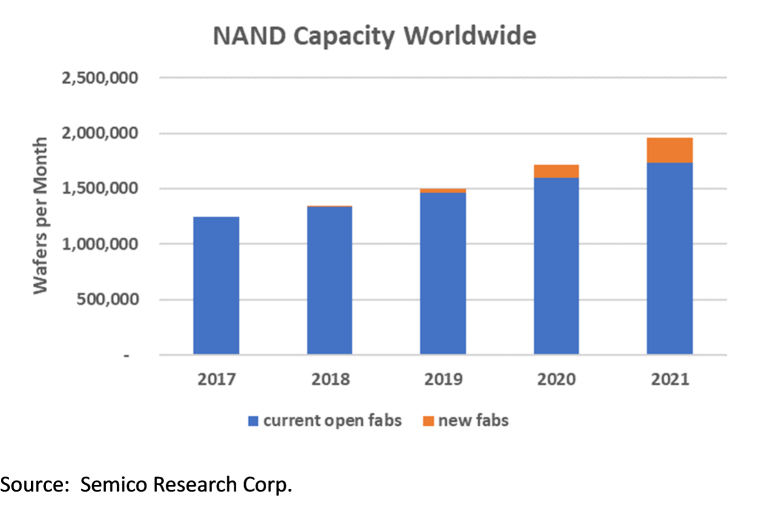 The chart below shows NAND capacity worldwide from 2017 to 2021. The blue portion of the columns represents capacity at fully operating fabs in 2018. The orange portion represents the amount of capacity being added by new fabs coming online from 2018 to 2021. These new NAND fabs are from Micron, Samsung, Winbond, Toshiba and YMTC. The total amount of wafer capacity added at the fully operating fabs grows at 8%-9% per year. With the new fabs added, the total amount of capacity rises from 8% in 2018 to 14% per year by 2021. The memory price drop comes at an inopportune time for Chinese memory manufacturers expecting to enter the market with volume production this year. The following section provides company-level information impacting memory production in China. SK Hynix has three major fab projects in the works. Fab C2 in Wuxi is one of their fab projects that began equipment install in December 2018, with volume production expected in 2Q19. This fab will be used to convert from 2Y/2Znm processes down to 1xnm. In its 4Q18 earnings call, company representatives indicated they are planning to reduce capex in 2019, depending on various factors including the pace of the ramp-up. Tsinghua Unigroup broke ground for a new 12” 3D NAND fab in Chengdu in 4Q18. Yangtze Memory Technology Company has been sampling 64-layer 3D NAND chips and plans to mass produce them in late 2019 using its own proprietary Xstacking technology. The company plans to have capacity of 100,000 wspm at that point. The company reports that it has been producing 32-layer 3D NAND in small volumes. The company plans to be in volume production of 128-layer devices in 2020. UMC announced that they “have suspended all R&D activities we are performing for Fujian Jinhua.” Almost half of the employees assigned to DRAM are being moved to other positions within the company. UMC was helping Jinhua develop a DRAM process for use in Jinhua’s new fab in China; the project began more than two years ago and was focused on the 32nm node. The actions follow charges from the United States government that UMC and former Micron employees stole details about Micron’s memory technology for use in the joint venture. The US government has banned American companies from exporting technology products, including semiconductor manufacturing equipment, and software to Jinhua. The almost $6 billion fab in Jinjiang City, which was close to beginning trial production, has been put on hold because of the ban. Because the future status of this fab is unclear, it is not represented in the above DRAM chart. Servers are a growth market for DRAM, making up a growing percentage of sales from SK Hynix and Micron. Automotive is another growth area, as are smartphones; although smartphone unit shipments are stagnant, the semiconductor content per phone continues to increase. New flagship phones in 2019 are expected to have as much as 12GB of memory. At the heart of this growth is AI, which increases the need for memory for autonomous driving, as well as processing at the server level. Samsung and SK Hynix are both developing EUV DRAM technology. The implementation of EUV will bring some much-needed product differentiation for the companies, as EUV will boost performance and power efficiency while continuing chip scaling. This increase in performance and power efficiency will be necessary for both 5G and AI applications.